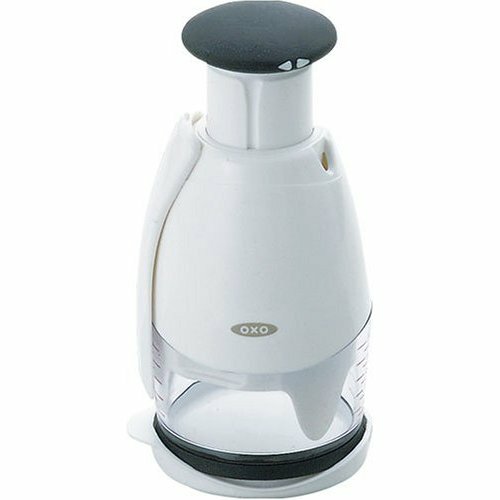 Simplify the task of chopping garlic with the OXO Good Grips Mini Chopper, smaller and more efficient for fine dicing. 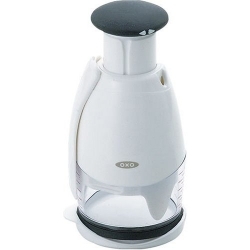 Make easy work of chopping, just press the soft knob and the blades rotate for even chopping. An internal soft bumper absorbs shock to increase comfort and reduce sound. Chop ingredients in the enclosed cup with its soft, non-slip base, or remove the base and chop directly on a cutting board. A tab rotates within the cup to prevent food from accumulating on the side walls. The entire blade cartridge can be removed from the shopper by simply unscrewing it, so clean up is a breeze. The blade is symmetrical for ease of reassembly.